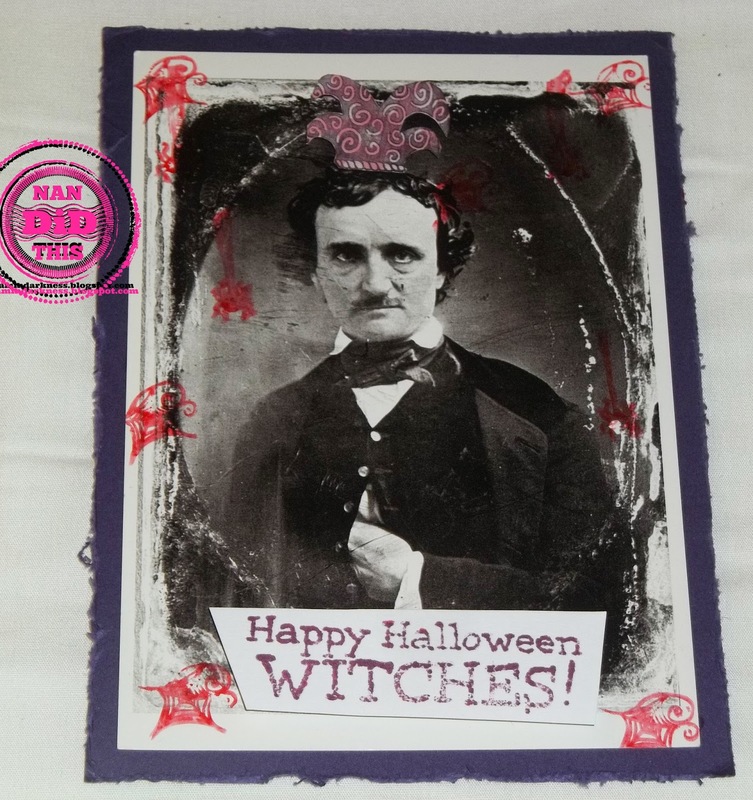 Well, CT Nan, and you all know my absolute love of Edgar Allan Poe and I gave him a true tribute earlier this month. But now I like to think poor Poe had to have smiled at some points in his life and maybe had a very dry sense of humor? So here is my thoughts of what he might have to say to us all as we celebrate Halloween with the 31 Days of Halloween! The postcard was given to me by CT Anne in a happy mail from Silvercrow Creations, a most wonderful place to find things you won't find anywhere else! The postcard is really grainy looking; it looks like it could have just been taken it off of his last fiancee's wall. Stamped with some red Distress Ink and stamps of hanging spiders and webs with a "sweet" sentiment :) And of course a pink party hat on to "top" it all off! We are still checking the Frog's inbox for your entries each and everyday! Don't make us have to tell on you! You know that Frog's temper...EEEK! Now hop (I crack me up, I really do! Hop..Frog...hehe) off to the next stop and get inspired then hop back here and drop off your inspired make! Then happy folks everywhere...also leave some love at each stop...it makes us squeal with evil delight! Love your take on Poe Nan. This is great! I love his hat! so awesome Nan. I love Mr. Poe also you made a fabulous piece. Never did care for Poe very much. This is totally POE-tastic, love it Nan!